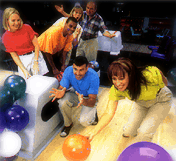 A bowling fundraiser can be a great way to raise funds and have fun. Here are a few ideas for a successful bowling fundraiser that could end up being an annual favorite for your group! A bowling fundraiser is a great way to raise money! First of all, it’s a lot of fun. Second of all, people of all ages can participate, and best of all – you don’t have to set-up or clean up! So how do you organize a successful bowling fundraiser? As with any event, you have to start by creating a lot of publicity. The more people that know about it, the more funds you can raise and donations you can get. While people are bowling, entertain them! You can also have a raffle, giving out prizes that you collect from local sponsors. Even if the gifts are small (free bowling passes, for example), it will contribute to a fun atmosphere. To get a competitive atmosphere going, have the bowlers compete for the highest game and the best team. To make it funny, you can also get them to compete for the lowest game and the most gutter balls! Of course, you would only announce the winners at the end, but you could let people know how they are doing along the way. Make sure to have some prizes for all these winners. As with the raffle gifts, the prizes can be donated from local sponsors.